Since the abdominal area contains many different organs it is divided in smaller areas. One division method, uses one median sagittal plane and one transverse plane that passes through the umbilicus at right angles. 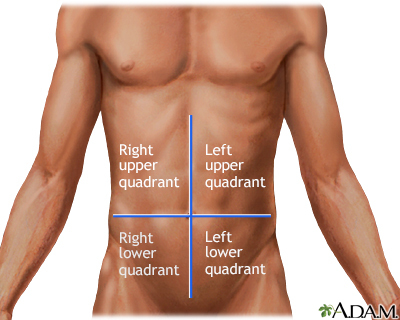 This method divides the abdomen into four quadrants. Medical personnel can easily refer to these quadrants when describing pain or injury regarding a victim.